It has been two months since we introduced our first iteration of a Rank System in Update #22. We knew going in that this was a system you had been asking for and watched your feedback closely after its implementation. We found that players were most disappointed that climbing ranks was rather easy and even the highest ranks could be achieved вцthrough grinding and overall passive gameplay. As a result, it became clear that the prestige behind these ranks wasn’t what we had intended. It was decided that while we work on a more appropriate system that puts the correct focus on playtime and skill, we would repurpose the existing system to highlight one of PUBG’s ultimate goals - to survive. This means the focus of improving is no longer directly about competing with other players, but rather to grow by overcoming your personal struggles in the game while honing your skills. For the coming Beta Season 2, this will take the form of Survival Titles that can be earned by gaining Survival Points during the season. We designed the new Survival Title System so you can see how you progress, going from zero to obtaining honorable Titles through continued play while improving your skills. And while this is also a beta and can change with your feedback, here’s some more information on our thoughts and goals for the new Survival Title System in Beta Season 2. While we work on another way to track competitive progress, we’ve discontinued the current placement system and are utilizing some of its aspects into the new Survival Title System. As stated before, the new system is based on personal growth, instead of having your placement being decided based on competition with others. The existing Rank Point (RP) of Beta Season 1 will be changed to Survival Points (SP). Players will begin with 1 SP. If you collected RP from Beta Season 1, your RP will be soft reset and a portion of your results from the previous season will be applied as SP. With the Survival Title System, you can obtain Titles through consistently playing the game. We’re using the same icon assets from the previous system (with a couple names changed to be more in line with survival) and adding extra stages in between each milestone below Expert. Once you reach Expert, there are no longer any divisions, but progression will be more difficult and influenced more by a higher ranking and kill count in every session. We have also discontinued the demotion system from beta season 1, meaning once you achieve a Title, the only place to go is up (with exception to the Lone Survivor Title, detailed below)! SP gain efficiency will be tweaked slightly between different game modes (Solo, Duo, Squad) in an effort to keep each mode fair and balanced to prevent any as being seen as the only viable way to grind SP. As the top end of this system, only the top 1000 players are able to acquire the Lone Survivor Title. Once you reach the required amount of SP for Lone Survivor, you will have to continue earning SP or risk being bumped by a competitor. You will retain the Lone Survivor Title as long as you remain in the top 1000, so play well and play often to show off your prestigious title! The Leaderboard has been improved to highlight players who have made it to Lone Survivor. This leaderboard will be updated every 2 hours. 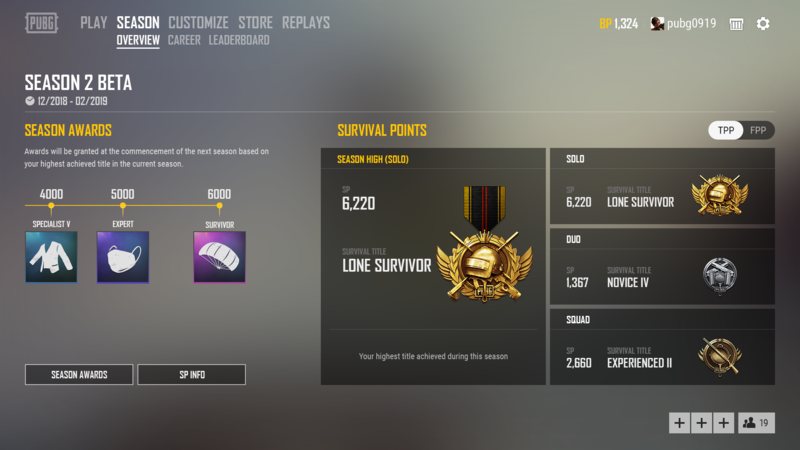 Lone Survivor players who do not play a match for one week will be removed from the Leaderboard. * The above image is in development. Final details may be different. We’ve added a reward system for those working their way up through the new Title System. For Beta Season 2, you will receive rewards based on the highest Title achieved during the season regardless of Mode or Perspective (FPP/TPP). Those rewards will be given out at the start of the following Season. Novice through Survivor Titles will receive rewards as their milestones are achieved. 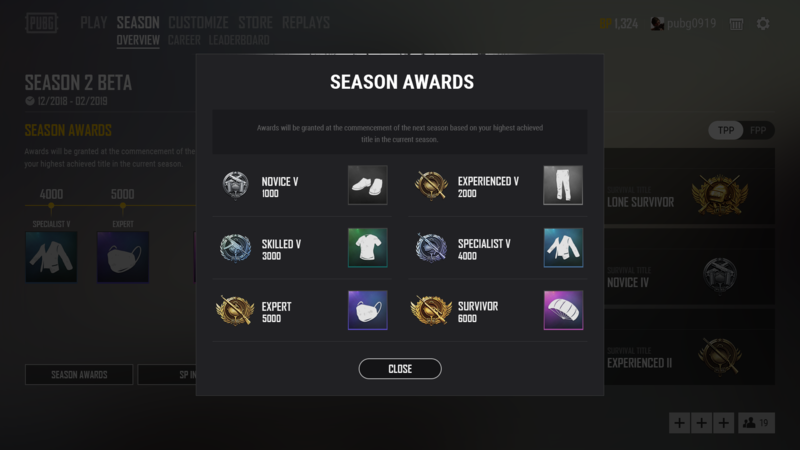 You can check your status, which can be checked in the Title information on the “SEASON - OVERVIEW” page of the game lobby. Lone Survivors will receive the same rewards as Survivors and will only retain the Lone Survivor Title while within the top 1000. To everyone who participated in Beta Season 1, we offer our sincere thanks. Season 1 ends on December 12, 2018, but there is still time to participate and share your feedback for future iterations of the system. 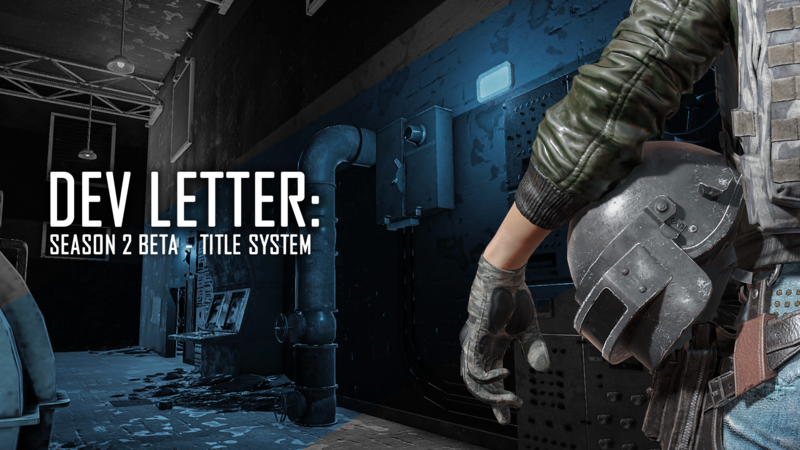 The new Title System and Beta Season 2 will be applied to the test server on December 7, and will be released to live servers on December 19.